Huracán Performante is the fastest by a small margin. This comparison has been viewed 12.9k times. There even from 0-100mph, But then those times after 100mph dont make no sense, 0-100 a .1s difference, 5.5 vs 5.4, Then 0-130 almost a second difference to the L, 9.8 vs 9.1 Then a 1.2s difference 0-150, 11.8 vs 12.9, this time to the P, Then a .2s to 0-160, 15.2 vs 15.4, These times should not be bouncing around like that, Unless there from different tests? Not really important just thought it seemed weird. Hats off to Porsche for making a 1500 kg 700 hp RWD car that doesn't spin out in every track it goes to. They have used the time honored trick of "Add a really goddamn motherf***ing big wing to the back and a massive splitter in front and some wild fender flares" The Lambo does look better though, and if I was buying a car for 1/4 mile times, I'd get the Lambo. Lamborghini is the only naturally aspirated super sports survivor, yet still a faster car in total and unlike Porsche it is much more attractive from every single way, it looks epic ,it sounds epic and it's not just a car,it is art! 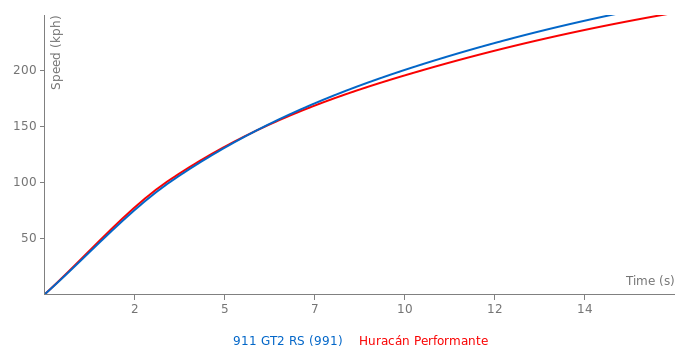 The GT2 RS has a hell of a lot faster track times AND it also has faster 0-150, 160,170,180.190, and 200. And this is coming from a Lamborghini fan!